What I did at Q.U.T. Q.U.T., school of optometry/Centre for Eye Research. My job at QUT (Queensland University of Technology) is similar to that at UQ. I design and built electronic equipment for a number of research units and kept the place running electronics wise. For me this has been the era of the 68HC11. While I did look at other micros and put together a 68HC16 system and more recently some Atmel AT90s1200 stuff. Mostly the HC11 has been the workhorse I've used for almost everything. I won't attempt to keep everything in exact chronological order because some project are ongoing and have been modified many times. The opthalmatron (David Atchison) - The is an antique piece of equipment for measuring the power of a human lens. The opthalmatron was modified by my predecessor to do continuous recording instead of a single shot mode. The opthalmatron needed much attention to keep it alive long enough to complete a series of experiments it was used for. LED Controller (Andrew Carkeet). A HC11 based device for flashing two LEDs with a user downloaded wave shape (usually a Gaussian). The time delay between to two flashes was accurately controlled. Chart recorder replacement. (Chris Wildsoet). A HC16 based signal generator, and data logger which interfaced with and eye-tracker. This is used in prac classes. The device has a graphical LCD running a simple GUI I wrote. The data which was logged could be printed out on a cheap dot matrix printer. Eye tracker (Chris Wildsoet). A replacement for a dead eye tracking unit. This uses a IR LED flashing at 3Khz (I think) and a pair of IR detectors plus associated filters and amplifiers to detect the direction of gaze of a human eyeball by detecting the reflected light off the iris. Stretcher (Chris Wildsoet). A HC11 based controller which stretched a piece of tissue using a stepper motor screw drive and measured and logged the tension at each step using an FT-03 force transducer. Eye track ( David Atchison). I interfaced a commercial eye tracker to a PC and also interface the PC to an auto-refractor. PC software was in turbo-vision. Traffic Light simulator (David Atchison). A HC11 based controller which simulated traffic lights measured subject re-action times to different colors and brightness. This was done by building two small filter turrets and back lighting them with HC11 controller lamps. PC software was in turbo-vision. Interferometer (David Atchison). A HC11 based controller to automate stimulus presentation on a interferometer. This allowed a number of visual acuity tasks and contrast sensitivity task to be performed. We were trying to match these tasks with similar ones based on a VSG (see below). PC software was in Delphi. VSG (David Atchison). The VSG (visual stimulus generator) is a PC based card for generating gratings and other visual stimulus and a monitor. PC software was in Delphi. Car timer. (Joanne Wood) A laptop PC based re-action timer for test drivers on a test track. The PC turns on one of 5 possible lamps when the researcher pushed a button and then measures the time taken for the driver to press the brake pedal. Light house (Joanne Wood). A HC11 based controller which controlled the speed of a rotating mirror and also fired and electric shutter. This is for testing dynamic visual acuity by projecting moving image on a screen. That is - to test a persons ability to identify moving targets. Merry-go-round. (Katrina Scmid). A HC11 controlled optokinetic drum. That is a drum which rotated in a particular manner and is stripped on the inside. Something to make chickens dizzy. Stereo Acuity tester. (Michael Collins) A HC11 based controller to move some pins under PC control. This is to test depth perception. PC software was in Delphi. Video Attenuator (Neal Strang) - a resistive attenuator for mixing RGB video outputs into a high resolution monochrome signal. UV dose meter (Tom). A HC11 based UV dose meter which has two parts to it. One was a matchbox sized unit which was worn like a badge. This was experimentally worn by professional arc welders. It measures UV dose, total arc time and the number of arc strikes. The second part plugged into the first and had a LCD display and switches for reading out the dose measurement and resetting the device. Double flash apparatus (Brain Brown). A HC11 based controller for presenting accurately time pulses and pairs of pulse from a LED. It also rotates a stepper mounted neutral density wheel. Stiles-Crawford apparatus (David Atchison) A HC11 based controller for measuring the Stile-Crawford effect for images projected into different parts of the eye. The optical set up in quite complicated. The controller moves a stepper driven xy stage and controls a pair of LEDs - one of these LEDs can be varied in brightness over a range of 10,000 to 1. PC software was in Delphi. Vernier Alignment apparatus (David Atchison) A HC11 based controller for measuring vernier alignment for images projected into different parts of the eye. It controls the same xy stage as the Stiles-Crawford setup plus it lets the subject align a spot on a CRO with a fixed target be using a joystick. PC software was in Delphi. This is one of the many printed circuit boards (PCBs) that I've designed and built over the years. I guess I've done over one hundred by now but not all as complicated as this one (but some more so). Many of my PCBs use microcontrollers. In recent years I've mainly used the M68HC11 Microcontroller but before that it was the 6511Q and before that the 6502 (a microprocessor not a microcontroller). In future I might use the 68HC12. The image above is a screen shot from the PCB design program (protel). The red lines represent the tracks on the top side of the board and the blue ones represent the bottom ones. The gray dots are pads. 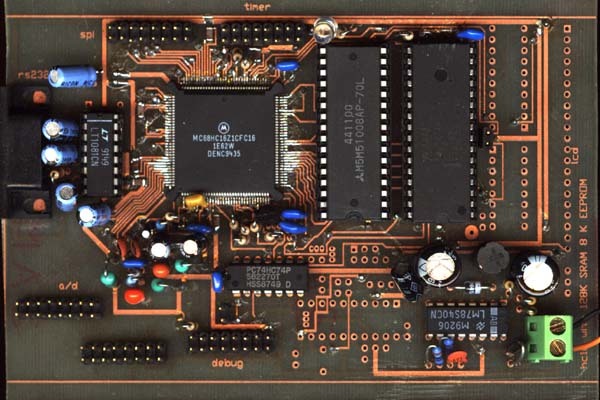 The above image is a scan of an actual PCB. This particular PCB is based on the M68HC16 Microcontroller which is the square chip slightly to the left. To the left of that is a serial interface to a PC and to the right is a RAM chip and a flash rom chip. The components in the bottom right corner are the switched mode power supply. The components which have been omitted (empty holes) are for an interface to a graphical LCD. This is my lastest PCB (dec-1997). It's a 68hc11 based PCB that interfaces to a PC via an rs-232 serial line and controls one or two stepper motors, up to four lights, senses up five limit switches and it has other spare inputs and outputs for future expansion. While intended as a general purpose card it's current application is a part of a stereo vision testing device. The hc11 is programmed in forth-assembler and the PC in delphi.